The storm brought me back here. Stevens has gone through more of them than I have. “Agnes” is forever a dirty word in this valley. Sandy could have been just as bad, but she spared us for the most part. Just as (again, with a few violent exceptions) our area was spared last year. Two bullets dodged in two years. I’m feeling uneasy. How long will our luck hold out? And is it even fair to say we got “lucky” when other portions of the east were demolished? My Dad used to take us to Long Beach Island as kids. You could get a cottage a block away from the beach for $150 a week. Those were the days. I love LBI. Years later I brought my own family there. We could only stay three nights because a hotel room for one night was double what my Dad paid for a cottage for an entire week. Ah…the free markets and all that you know. But still, after they pried the credit card from my clenched fingers and swiped it, it was like stepping back in time. The hotel we were at was maybe a dozen blocks from Liberty Ave, where we used to stay. I walked down there. The houses are all houses now, not what used to be called “cottages”. And as such they looked a bit more….er….grand. No more outdoor shower stalls in the back. But still. The dunes. The uphill walk on the hot sand and then….the crashing waves. The kites in the air. The ice cream trucks with their ringing bells. The squeals of delighted kids. The whistles of the life guards. The relentless patrols of those Orwellian teens checking for beach badges. It was the same place. I was there the summer JAWS came out. I saw it in a movie theater near Bay Village. I vowed to never go back in the water. But like most, I did. But I don’t go out nearly as far. On our recent trip back I spent a lot of time in the LBI museum (I had the place pretty much to myself. The only other name in the guestbook that day was a guy from….guess? Scranton). Much of it was taken up with pictures from a long ago storm that devastated the island. The pictures were ghastly. Much like the ones we’ve been seeing on the news the past few days. You couldn’t imagine the place could recover. But I was standing there. It had. Can it do so again? The hotel I stayed in with my family? I saw a picture of it a few days ago. It looks like somebody drove through it with a bulldozer. It’s gone. The way these things work is so tricky. Just a few days after the storm, and most of the cameras and reporters have packed up and left. Their job is important but limited. They can’t stand in front of the same wrecked houses and issue the same reports day after day. So they move on to the next story. When they leave, those of us not affected tend to forget those who are. We’re not being callous, but when I stop and think about it, to a resident of LBI who lost everything, and with no insurance, not much chance of getting any of it back again, we must seem a little frigid. At least. So I text a $10 donation to the Red Cross….maybe more to ease my own mind than anything else. The gesture seems so…small. So trivial. I don’t even have to get off the damn couch. I read in a New Jersey paper that it’s going to cost hundreds of millions of dollars just to shovel the sand off the roads. I wish we could all do more to help when help is needed. I wish the world moved at a pace that allowed for more reflection….and less immediate thoughtless reaction. Some days it seems a victory to simply close the garage door behind you. You can finally exhale. Or scream. I want to go back to LBI. I want to take my kids. Or maybe it will be them taking me (picking up the tab too….can’t imagine what the free markets will have done with hotels by then). 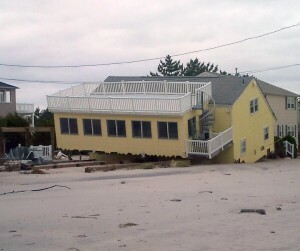 I want to see pictures on the museum wall of what Sandy did in 2012. And I want to stare again in wonder at the resiliency of the human spirit. ~ by admin on November 2, 2012.